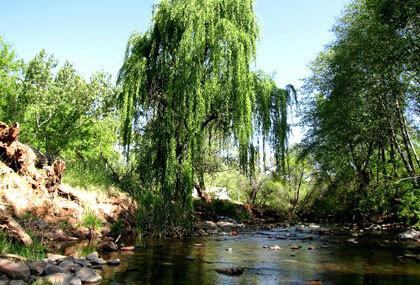 Page Springs sits on the banks of beautiful Oak Creek in a storybook setting of old cottonwood trees and artesian streams. A restaurant at the entrance provides fine dining. Elevation: 3,850 ft.
Scenic tours, Indian casino, Indian ruins of Tuzigoot and Montezuma's Castle (15 mi), Sedona with its famous red rocks and unique shops (10 mi), the old ghost town of Jerome (16 mi), numerous monuments, state, and national parks. Clubhouse, laundry facilities. Fishing, hiking, horseshoes, bird-watching. Reservations required for RV sites and may be made up to 60 days in advance through RPI's Central Reservations Office. Peak seasons are October 1 - December 15 and February 1 - April 30. Check in/out times strictly enforced. RPI rate is for 1 RV and 1 tow. Up to 4 people. -This campground requires a credit card on file to make reservations. -RVs older than 15 years are restricted. -All sites have water, electric, and 30 amp service (no 50 amp). -A $3 daily resort fee will be added to the nightly RPI rate. -The RPI rate is for 2 adults and 2 children. Max 6 people per site. -This park accepts cash and credit card payments only (no checks). -A $5 fee will apply for additional people, cars, tents, trailers, early check-in and late check-out. -You must have 7 days between visits to other Sunrise resorts. From North or South, take I-17 to Hwy 260 west. Exit to Cottonwood (89A). Turn right on 89A heading north approx 7 miles. Turn right on CR 50 (sign Page Springs Fish Hatchery), go 2.6 miles. At Up The Creek Restaurant (on left), turn left into park driveway (downhill entrance). Do not follow GPS to take Cornville Road to page Springs Road. There is NO RIGHT TURN into the park from this direction. GPS: 34.766591, -111.891499. Get directions from Google Maps.